A combination of notes on the lessons and general diary stuff about Hullzapoppin, a dance camp in Hull. I don’t always make these public out of a vague fear of the lindy blogsphere descending on me and telling me what I got wrong, but what the HellHull. Possibly only of interest to dancers, though the rest of you may be interested in the part with the blow up doll, I suppose. Up the A1 and over the Humber bridge to Hull. A nun walking in the grounds of the Endsleigh Centre welcomed us in and wished us a lovely weekend. We registered and got our wristbands: Intermediate Advanced ones were black, which goes with everything. We stayed in Westfield House, which was great. It’s a big house in a leafy suburb of Hull. All of the 4 rooms were occupied by lindy hoppers, as it turned out. The landlady made the breakfast room available at all hours, which came in handy for late night toast parties. Unfortunately, the house is on the market, so we may not be able to stay there next year. We ate in Fudge, which seems to be the subject of some sort of smear campaign on Trip Advisor but which was rather good. Back to the Endsleigh Centre for the Friday night dance. It was crowded but manageable. 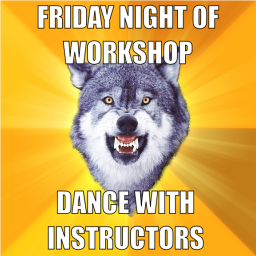 I danced with once of the teachers without realising she was a teacher, so don’t technically deserve my Courage Wolf meme, but managed not to totally embarrass myself. Make investments in reducing latency rather than just comparing hours spent with value gained.